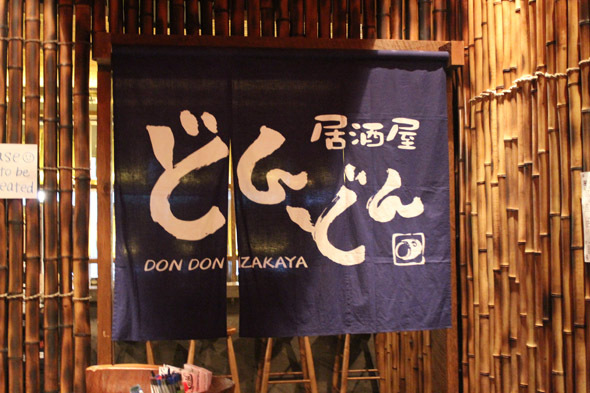 Don Don Izakaya is a recent entrant to Toronto's growing izakaya scene and offers an immersive experience in the culture of the Japanese-style tavern. The journey began as I entered via wooden arches on the street, headed upstairs to the bamboo-covered hallway, and passed through the hanging curtain. It lives up to its name as each entering party is greeted with a brisk don! don! on a taiko drum. I've spent a lot of time in izakayas in Japan, and braced myself for a pale imitation but instead was overwhelmed with nostalgia. The staff, dressed in traditional uniforms, trade a constant stream of casual Japanese over the heads of the patrons. The menus are brightly coloured photos of each item, labelled in Japanese and English. Guests sit at communal tables in a well-lit room. There are private alcoves, and one large room for private dining in which you take off your shoes. Wooden placards above the kitchen innumerate menu items in Japanese. The first round of food came quickly. A favourite was spicy grilled shrimp tossed with crispy okra ($6.50). The surprise hit was the Cherry Tomato and Friends salad ($6.80). Peeled cherry tomatoes are soaked in honey and tossed with bocconcini and raisins. I loved the kimchi Tokyo Style Hot Dog. The kimchi is fresh and thick, and the bun crispy. The dog itself is sweet, which is normal for Japan but perhaps strange for Canada. It was kindly sliced into sharable pieces. The show piece is the wood-smoke grill used to flash-sear cuts of sashimi. Flames leap up as a beat is drummed out on the taiko. The staff cheers the chef on as he toasts the fish, and it's quickly sliced up and plated with a line of salt. We tried the salmon ($11.50) and found it soft as butter with elegant smokey flavour. I loved the avocado croquette ($4.50). A whole avocado is pitted, filled with corn and frittered. Once cooked, the peel is like that of an eggplant and adds pleasant bitterness. Unfortunately as the place filled up service became scattered and inattentive. We waited half an hour for water, and part of my order was forgotten entirely. Dishes came out of order and I received my croquette at the same time as another guest got his dessert. We waited 45 minutes for the Eggplant and Chicken Au Gratin ($6.80). It was a solid dish when it did arrive, but by that time people had already finished dessert and were impatient to leave. It is of course a menu of small plates, all of which would serve as appetizers at another restaurant. The prices aren't low, and ordering enough food to fill a belly adds up quickly. We left feeling that we would be hungry again in an hour, which isn't a great sign when you've paid decent money for a meal. The menu and ambiance call me back, but the service was so scatter-shot that I think I'll explore the city's other izakaya options before I make a return visit.